SSSD provides identity, authentication, and authorization services to the operating system and applications. On Fedora Atomic Host, it is possible to run SSSD in a container, using the fedora/sssd container image. With FreeIPA/IdM (IPA) server, sudo rules can be defined and managed and starting with Fedora Atomic 23.53, they are observed. As introduced in SSSD in container on Fedora Atomic Host, System Security Services Daemon (SSSD) can be run on Fedora Atomic in spite of not being installed on Fedora Atomic OSTree (host image) by default. Created symlink from /etc/systemd/system/multi-user.target.wants/sssd.service to /etc/systemd/system/sssd.service. Created symlink from /etc/systemd/system/docker.service.wants/sssd.service to /etc/systemd/system/sssd.service. We see bob is logged in, even if the account is not listed in /etc/passwd — SSSD in the container resolves the user identity and assisted with the authentication and authorization. /usr/bin/atomic needs to be run as root. Command sudo is typically used to grant access to run processes with elevated privileges, for example as root. Configuration and access definition is stored in /etc/sudoers and /etc/sudoers.d ... but it can also come from IPA server via SSSD. 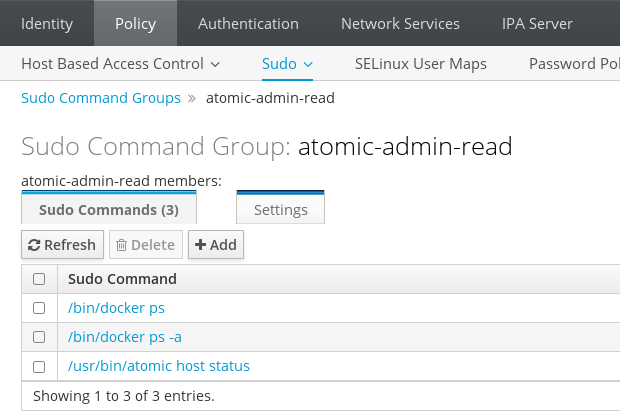 With the steps below we will configure Sudo Rule in IPA so that bob and every other user in atomic-admins user group can run some basic docker and atomic commands. If we need to add additional user to the group, we can use ipa group-add-member on command line or add the user via the + Add button on IPA WebUI. To make subsequent manipulation easier, we will define Sudo Commands in IPA and group them in Sudo Command Group. We can achieve that on WebUI, Policy → Sudo → Sudo Commands and Policy → Sudo → Sudo Command Groups. 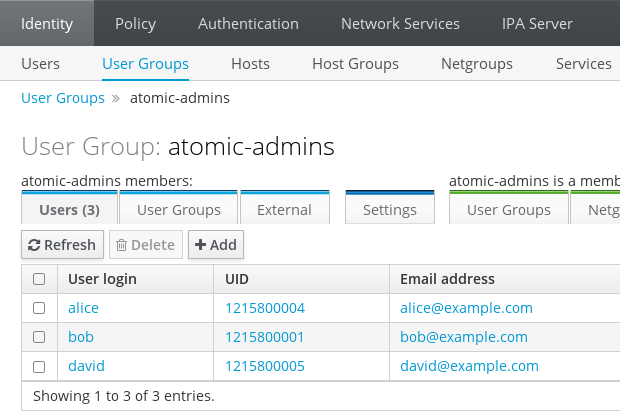 Added Sudo Command Group "atomic-admin-read"
Added Sudo Command "/bin/docker ps"
Added Sudo Command "/bin/docker ps -a"
Added Sudo Command "/usr/bin/atomic host status"
the users should not have to enter their password. and should get list of running containers. Added option "!authenticate" to Sudo Rule "atomic-admin-read"
The !authenticate option causes password-less execution, like NOPASSWD in /etc/sudoers* would. We can see the the command that used to fail when run directly because the user did not have access to the Unix socket used by docker daemon now passes. So will pass the other two commands specified in the Sudo Command Group. We've shown a simple example of defining Sudo Rule in IPA server and using it on Fedora Atomic Host. Of course, in real-world setups the rules will likely be more complex, perhaps using host groups as well, and having different sets of commands for different categories of admin users. However, the principles will stay the same and Atomic will be able to consume the rules, looked up and resolved by SSSD.